In his popular song Some Beach Blake Sheldon pictures himself in a chair beneath a big umbrella with “palm trees growing and warm breezes blowing.” He must have been thinking of Corpus Christi! They don’t call Corpus the “Texas Riviera” for nothing. Sand and sea are a staple in the Sparkling City. In fact, no city offers a more unique variety of beach fun than Corpus, where two distinctly different beaches beckon sun worshipers and sand castle engineers from near and far. In the shadow of the flattop USS Lexington and a short walk from the Texas State Aquarium there’s a strip of beach where mild waves lap onto a shoreline meticulously clean and exceptionally inviting, Palm trees and warm breezes included. Once upon a time the peninsula was called North Beach. But times have changed. Now the patch of land on the “other side of the bridge” has become one of Corpus Christi’s best attractions and the place where land meets sea (or more correctly, bay) is called Corpus Christi Beach. 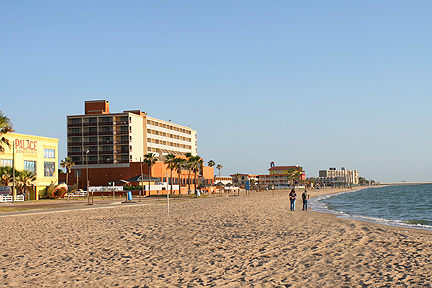 Corpus Christi Beach is on the west side of Corpus Christi Bay and the northern tip of the city. The waves are gentle and free of the flotsam and jetsam that float about in the Gulf that sometimes washes up coastal beaches. It’s a safe option for families with young children who love salty beaches but worry over big waves and rip currents. And Corpus Christi Beach is in a great location, just minutes from restaurants, attractions and fine hotels. Then there’s Padre Island. Corpus Christi Beach, pristine and upscale, sits at one end of Corpus Christi while miles and miles of Gulf coast sand spreads out as far as the eye can see at the other end of the city. Padre Island’s beaches are wild, wooly and wonderful alternatives to the tame splash and play of CC Beach. They’re all sand, sea gulls, surf, and sunshine! There’s rarely a day that a horde of surfers, or at least one lone brave rubber-suited fanatic, can’t be seen out in the water seeking the perfect wave. Most of the year there are swimmers splashing around, too. In the distance one is likely to spot a pickup backed down the beach with a half-dozen salt water fishing rigs sticking in the air. Yes, there’s all the beaches any land-lubbing country music singer can dream about. But that’s only the beginning. Corpus Christi’s climate and location combine to make even the most agoraphobic long to be doing something outside. The problem is not whether to do something but what to do. Choices are many! Perhaps the second most popular activity in Corpus, next to beach bumming, is fishing. The options for fishing are absurdly diverse. There is, as mentioned above, surf fishing in the Gulf. There’s deep-sea fishing with boats leaving from harbors in Corpus Christi or down Mustang Island in Aransas Pass. There’s fishing in the Laguna Madre which lies between Padre Island and the mainland, and then there’s fishing in the bay. Bob Hall Pier juts far out into the Gulf off of Padre Island. 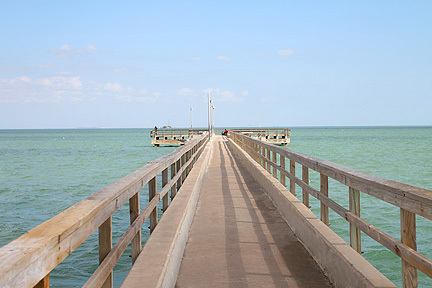 This pier is a favorite for shark fishermen and salt water anglers. On the bay there’s another great fishing pier at Cole Park, a couple miles south of downtown. Another popular fishing spot is off the break water jetty that protects the downtown marina. Other folks like tossing a line in the ship channel. 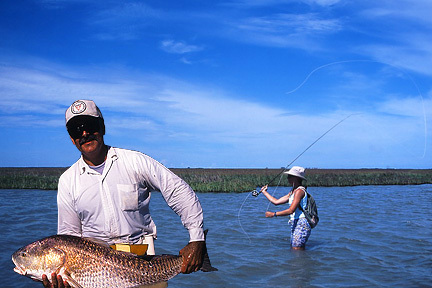 Wade fishing, crabbing or gigging for flounder are also rather popular activities in the abundant shallows of Oso Bay (a small bay cut off from Corpus Christi Bay by the island where Texas A&M Corpus lies) and the Laguna Madre. 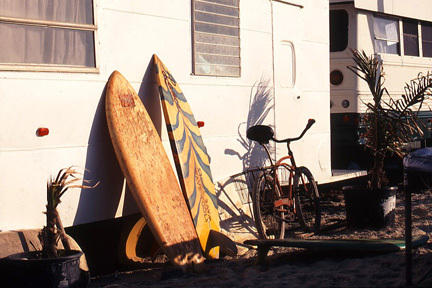 For those that want more action than lounging on the beach or fishing there’s always the option to take up a surf board. Surfing is very popular on Gulf beaches. 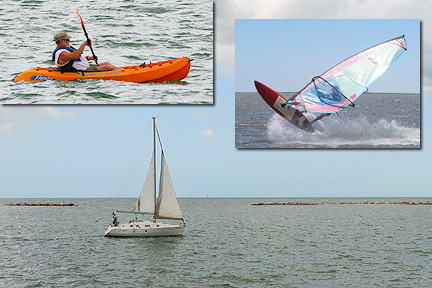 Corpus hosts the U.S. Open Windsurfing Regatta once a year and there’s a regatta every Wednesday evening as well. There is, of course, the option of sailing without the need for strong limbs and quick reflexes. Corpus Christi Marina is home to dozens of sail boats and water craft, many for charter or rental. The marina provides state of the art piers, slip rentals for visiting boats, and a whole lot more. Corpus Christi marina is located within an artificially constructed harbor adjacent to the city’s downtown area. On the other side of Padre along the causeway some folks try out yet another not-as-easy-as-it-looks sport: windsurfing. The wide open flat expanses of shallow water along the causeway are the perfect place for beginners to learn how to ride the wind. On up towards town, along the bayfront, one often finds more experienced windsurfers. Their colorful sails flash along the water, taking advantage of the fact that Corpus Christi is one of the windiest cities in the US. Three man-made peninsulas, two “T-Heads” and one “L-Head,” are enclosed by a long rock breakwater. These peninsulas are not only home to the Marina but are also great places to fish or just sit in a lounge chair and enjoy the salt air, sunshine, and magnificent view. From the T-Heads one can observe the gentle curve of the bay lined with fancy homes interspersed with parks and culminating in the far distance at Texas A&M University. Airplanes are always buzzing the runways just beyond the university at Corpus Christi Naval Air Station. Perspective is a little different but the grand view remains the same further down Shoreline at the several parks that give access to the bay. The largest and most popular green space on Shoreline is Cole park, a sprawling area with a massive children’s playground, an amphitheater and covered picnic tables in addition to the previously mentioned fishing pier. Further down Shoreline is Ropes Park, named for a 19th century developer, Elihu Harrison Ropes, whose projects never succeeded but whose dreams and schemes led to eventual development of Corpus Christi as a deep water port. The park ends in tall bluffs where the view is spectacular. There’s a popular ghost story associated with Ropes Park, too. People claim to have seen the ghost of a woman in a white dress, a woman who jumped from a nearby balcony distraught over her cheating husband. Sometimes, somewhere along the bay, one can spy a lover of seagulls tossing out popcorn or bits of bread drawing thousands of seabirds from all over. Avian wildlife is abundant in Corpus Christi. Not only seagulls but many sea coast species as well as mainland birds live in and near the city. Bird watching, or Birding, is very popular in the Bay parks and elsewhere in Corpus Christi. From Padre Island to downtown Corpus and beyond birders have the opportunity to observe both inland and sea birds. One popular observation point is Hans A. Suter Wildlife Area, a small park on Oso Bay. 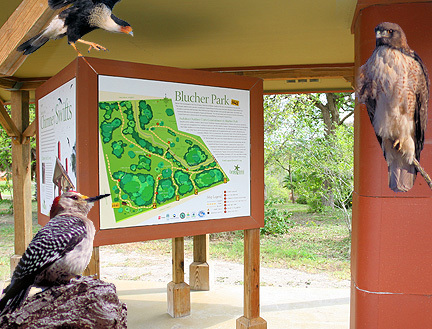 The downtown Central Library provides a unique observation area where birders can watch migrating and resident species in Blucher Park, another popular birding site behind the library. Always on the list of sites for birding is the South Texas Botanical Gardens and Nature Center, Located on Oso Creek in the far southwest reaches of the city. The Gardens have become a favorite destination for Corpus Christi visitors and locals for many reasons. Birding is certainly one reason, with the Gardens being on the Great Texas Coastal Birding Trail, but it’s only one of many attractions there. The Gardens and Nature Center have a number of varying exhibits from a butterfly garden, orchid greenhouse and indoor Bromeliad Conservatory to a hummingbird garden, an arid garden, and a Wetlands Awareness Boardwalk. The Gardens are not just a bunch of pretty flowers and plants, however. They’re dedicated to providing educational opportunities in abundance for children and adults. Events are held year-‘round to promote the Gardens. The city limits of Corpus Christi end a few miles shy of the National Sea Shore entrance. It encompasses only a small portion of Padre and Mustang Islands. But the outdoor recreational and leisure activities found in the Corpus Christi Bay area hardly end at the city limits sign. Port Aransas, Aransas Pass, and even up the coast a bit the little town of Rockport all offer a collection of activities such as fishing charters, boat rentals, fishing and swimming, sight-seeing, shopping or just relaxing. In fact, one exceptionally enjoyable excursion many locals take is a day trip around the bay. From Padre Island the trip goes up Texas 361 (formerly Park Road 53) to Port Aransas. From there take the ferry (always fun for the kids… or grownups!) to Aransas Pass. It’s worth the time to take a detour up Texas 70 to Rockport for a bit of shopping, some great restaurants and discovering life in the small coastal town. Back in Aransas pass the route goes northwest on 361 then turns southwest on US 181 at Gregory. It passes through Portland then returns to the city via Corpus Christi Beach. 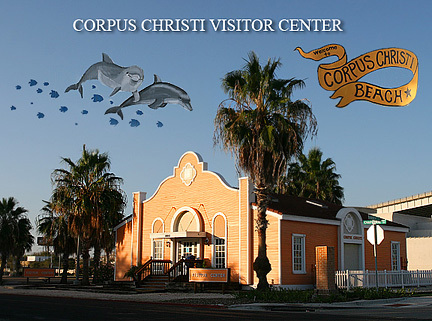 Corpus Christi certainly has a plethora of indoor activities from shopping malls to museums. It would be easy to toss away an entire vacation spending time outside only to get to and from a car. And Corpus attractions certainly are… attracting… but unless they are left behind, at least for a day or two, abandoned for the sunny skies, strong breezes, and stiff salty air found along the bay and down on Padre one cannot ever say he’s “been to Corpus Christi” for Corpus Christi outdoors IS Corpus Christi. So don’t just hold up in a motel room or sample the water with a big toe a few minutes. Get outside! Discover the real Corpus Christi! Phone numbers, addresses and links to Corpus Christi businesses and information sources.